Dancing for dollars: Mayor Caldwell fast tracks bill for $57,600 in contributions? In my last post, I wondered how public outcry can have so little effect against Mayor Caldwell's attempts to criminalize the homeless, namely Bills 42, 43, and variants. This latest set of proposed ordinances has seen four hearings where hours and hours of testimony opposing the measures have been offered by all sorts of people: the young and old, haole and Kanaka Maoli, activists, attorneys, clergy, social workers, homeless and former homeless, etc. Yet the mayor's bills criminalizing sitting or lying on the sidewalk have marched through without much opposition from the Council. And all this despite the fact that the mayor has been unable to present facts supporting the need for the bill or evidence of the efficacy of these sorts of "sit/lie" bills. On June 12, Mayor Caldwell transmitted Bills 42 and 43 to the City Council who immediately scheduled a special hearing to fast track it through the three council hearings required to transform it into law. After the City's Housing Director Jun Yang and Managing Director Ember Shinn were unable to respond with any substantial information about when their rumored Housing First solution would go online, the Council had no choice but to defer the measures (Full video of Council Hearing of July 24: http://youtu.be/nz1Y5QMrEMg ). But Rasputin and other bad things often don't stay dead, and the bills were resurrected. And again I asked, why does this happen? Well, I figured it out. I looked over the list of people submitting testimony supporting the Mayor's criminalization bills and decided to check the names and corporations (tourist industry all) against a database of contributors to local politics. Those submitting testimony supporting the Mayor's criminalization bills contributed $57,600 to him. That's just for the supporters and the corporations they list, and NOT family members or PACs not directly associated with the corporations or individuals. These guys are big spenders. In recent years they have contributed to State and County (not including Fed) candidates a total of $703,158. I haven't traced how much of this has gone to councilmembers. Yet. This goes beyond "pay to play" into the "dancing for dollars" territory. So yeah, I'll be at tomorrow's third and final hearing to testify against these bills criminalizing the homeless, but I don't expect to get much play. It's like walking into a pole dancing joint without any dollars. Right? I'm sorry it has come down to this. We each need to light a torch (and sharpen a pitchfork) against this sort of "government." The contribution dataset is updated as the Commission receives data. The set I downloaded is available on request. Here's a link to the Council's Agenda for 9/10/14. There are links to the texts of Bills 42 and 43, and their variants, Bills 45 and 46. 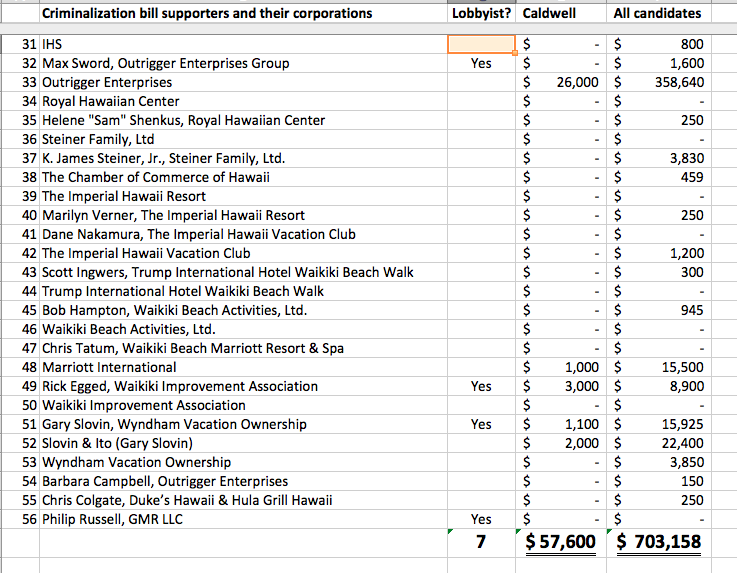 Another name to add to the list is Irongate (aka PACREP), the developer of the Trump condotel in Waikiki and the 2121 & 2139 Kuhio project (the Ritz-Carlton Residences Waikiki). Principals Casey Federman, Greg Brandes, Jason Grosfeld, his father James, mother Nancy, and wife(?) Jenna have contributed a combined $24,000 to Caldwell in this election cycle (and $8,500 in the previous election cycle). ... and their donations to all candidates in this election cycle total $70,450. Mahalo for the info, Ben. In this particular example, I was only tracing money from those who were on the Council's record as submitting supporting testimony. As you point out, other "players" are out there and exerting their influence in ways contrary to the public good.